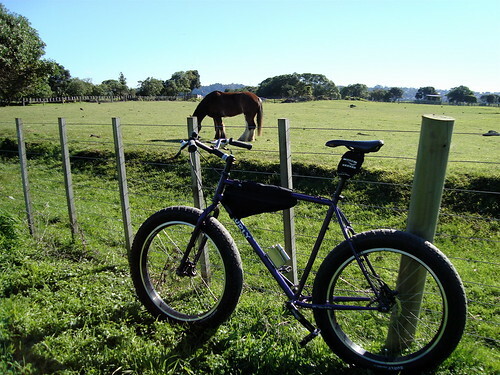 Great Rides: Mangere Bridge to Ambury Farm. Boys doing what boys do. 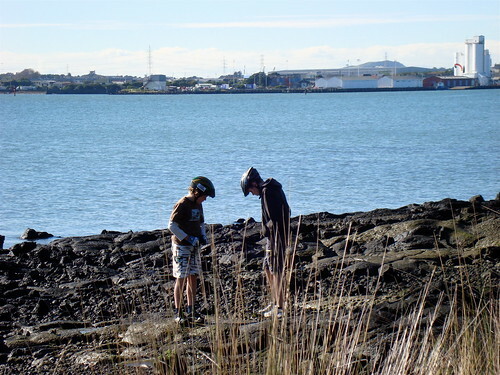 Onehunga Wharf in the distance. 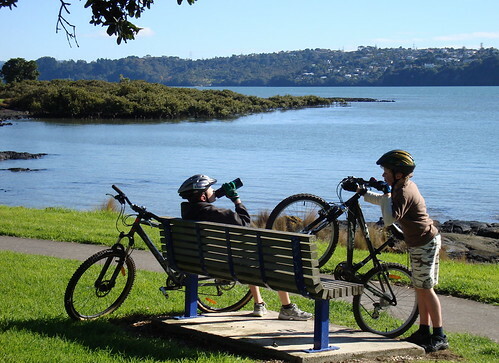 “Great Ride” might be a misnomer as the scenery is nothing special but after decades driving out to the airport and looking down at the old Mangere Bridge from its younger cousin it was a part of Auckland I was keen to explore. 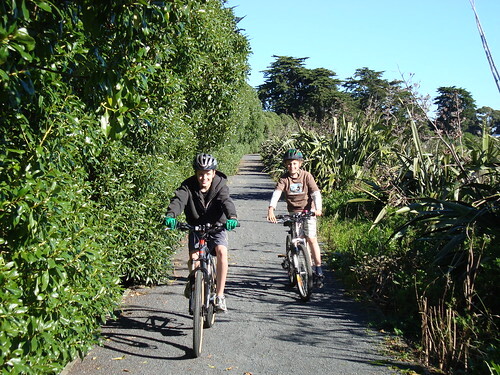 If you’re riding with children or avoid hills at all cost this is a pleasant amble along the coastline and back with some farm animals in the middle to keep it interesting for the city-slickers. I prefer a bit more up and down in my riding but I do recommend it, we all had a ball. Approaching the bridges from the Hillsborough end we passed the Cruising Club that sits alone at the edge of the motorway dipping its toes in the harbour. From this direction it looked like access was via Onehunga Wharf and when I spotted a large sign indicating where cars and pedestrians should go I thought we were on the right track. Wrong! The boys and I were soon scything through container-straddles, giant forklifts and semi-trailers like a scene from an apocalyptic Arnie movie. We quickly back-tracked to safety and continued on past the pub to a pedestrian ramp that curves up toward the giant cement silos. Shortly after we were riding along the old bridge watching the many fisherman lined-up to catch the turning tide and what was swimming in it. I’m amazed this bridge isn’t totally submerged by the spring tides as it almost kisses the top of the waves on a calm day. From here we followed our noses along the coastal footpath with great views across the Manukau to Hillsborough. Parts of this coast are sign-posted as bird sanctuaries and we passed thousands of gulls and oyster-catchers socializing on the grass. The ten year old mind is a strange and wonderful thing. Passing through a park gate as the route turns inland there’s a short stretch of gravel road leading to the entrance to Ambury Farm proper. 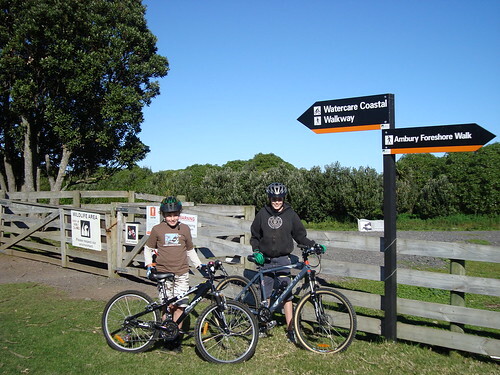 Here an information centre and toilets can be found but we rode on past various paddocks and corrals until the gate to the Watercare Coastal Walkway was reached. The entire ride is dead flat but this section of gravel is a bit lumpy and could be a chore on a narrow tyred road-bike. We then veered left and continued past turn-offs to various bird-viewing spots until we got to the lagoon. “Lagoon” might be an apt description at high-tide but we were greeted with a circular mudflat. But, and this is an important but when riding with boys, it was a mudflat with an island in the middle! Calculations were immediately made as to the number of pirates and escaped convicts it harboured and plans for how you could get out to it, and all going well get back again were quickly formulated. The beginning of the coastal walkways at the Southern end of Ambury Farm. After riding over the lagoon spillway we turned left at the “Bio-Waste Research Centre” situated at the Northern end of the waste-water plant. Not a lot of hand-shaking going on at their conventions I’d wager. The path around this small lagoon was in much better shape than the main-road and we skirted its perimeter in the sunshine, stopping for a bite to eat before heading back to the farm the way we had come. Smooth riding on the track that encircles the lagoon. The icy southerly blowing down the harbour had disappeared by this stage so instead of cutting corners and riding on the road we retraced our route back along the coastal footpath. My boys were starting to tire at this stage as I’d had them out mountainbiking for three hours the previous day. Even so I thought they’d get a kick out of riding back under the motorway bridge and this was a good call as it was the highlight of the trip for both of them. 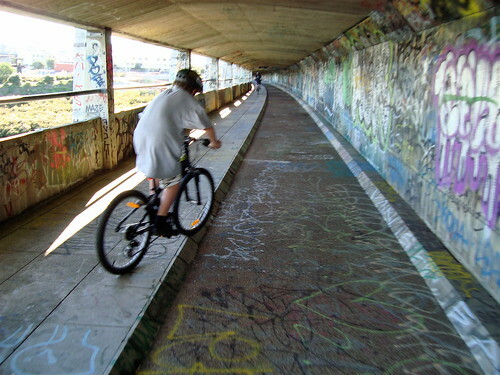 Sea birds, livestock, rabbits, horses and poo-factories, blah, blah, blah… give me a concrete tunnel covered in graffiti any day. 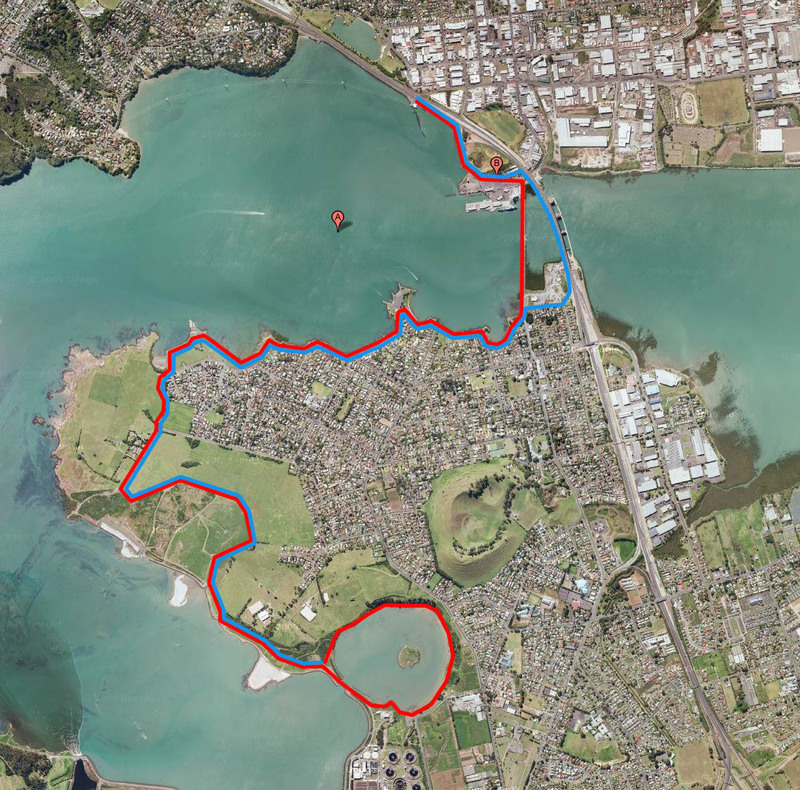 The walkway is suspended under the bridge (now there’s a novel concept) and it exits on the opposite side of Onehunga Harbour Road from the wharf, right beside the pub. It was a nice way to spend a winter’s afternoon and two hours removed from the Playstation is time well spent. ← Signs go up on Share-with-Care path. Do you know if that bridge/tunnel under the motorway still there? I’ve lived in the area since late 2010 and I’d never heard of it before. Yes Russell, I rode along there a couple of months ago although all the graffiti was gone. The entrances are on the western side at each end. Hard to miss. 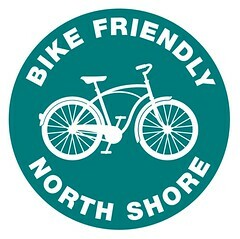 Shouldn’t be a problem if you are confident riding on gravel. It was a bit lumpy in places five years ago when this was written but the path is much more popular now so I would think the surface is better maintained. Don’t turn too sharply and easy on those brakes – no probs!